Spring Festival at Il Caffè Di Roma! Start with your choice of soup: Chicken Soup, Traditional Italian Lentil Soup or Creamy Mushroom Soup complimented with their exceptional garlic butter bread freshly baked for you. Get your daily dose of proteins, fresh veggies, carbs, dairy and calcium boost along with a selection of dressings from their freshly crafted salads. Breakfast buffet features grilled sausages and beef bacon to baked beans, hash brown potatoes, omelettes and eggs to order, pancakes, French toast, sautéd mushrooms and veggies. 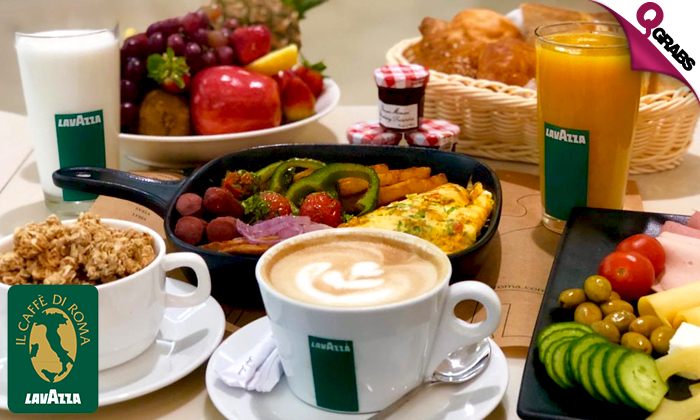 Also includes green salad, freshly cut crunchy veggies, assorted cheeses and labneh, cold cuts, assorted bread, butter, jam & honey, corn flakes, milk, fresh seasonal fruits, assorted fruit yoghurt along with their delicious homemade freshly baked croissants and muffins. Complete your meal with a classic coffee and juice. All sandwiches are served with French fries and a green salad. Chicken Club Sandwich – Double deck of sliced bread with mixed greens, chicken, cheddar cheese, mayonnaise, fresh tomatoes and boiled eggs. Piadina Delicata – Thin Italian flatbread wrap with chicken, melted mozzarella, red salad, sundried tomatoes, mayonnaise and pesto. Roast Beef Sandwich – Cereal bread with roast beef, horseradish, straccino cheese, mixed greens and fresh tomatoes. Margherita – Tomato sauce, mozzarella and fresh basil. Salame di Manzo – Tomato sauce, mozzarella, beef pepperoni and black olives. Penne All’arrabiata – Penne pasta with cherry tomatoes, fresh basil, garlic and onions, served with homemade spicy tomato sauce. 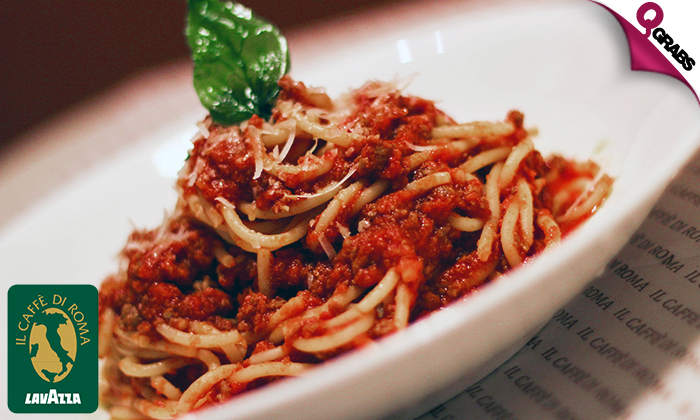 Spaghetti Con Bolognese – Spaghetti with minced beef, tomato sauce and parmesan cheese. 50% off Italian food for your soul! Il Caffè di Roma serves excellent blends of coffee that offer you a satisfying intense and fragrant aroma. The menu at Il Caffè di Roma stands out not just for its variety, but also for the quality and the care that goes into all the dishes and beverages. Il Caffè di Roma is a real oasis of pleasure, the perfect place to reacquaint yourself with good company and savor a good chat together.